(LC) Lead Crew mission. For Mission dates, targets and Mission Reports, see Combat Missions. Capt Addell A. Cote (P)(KIA) - Flew on 24 credited combat missions. First Mission (43) flown as a Tail Gunner/Observer with Capt Billy B. Southworth (P). Mission 59 flown as CoPilot with Lead Crew and Air Commander LtCol Kermit Stevens. Other missions flown as First Pilot. S/Sgt Cecil M. May (BTG) - Flew on 19 credited combat missions - With Capt Cote (17 credited missions - 44, 45, 47, 48, 49, 50, 51, 52, 55, 57, 58, 59, 60, 63, 73, 74, 83); With another Pilot (2 missions #43, 56). S/Sgt John M. Micek (RWG)(KIA) - Flew on 24 credited combat missions - With Capt Cote (23 credited missions - All of Capt Cote's 24 missions except for #43; With another Pilot (1 mission #43A). 1Lt Alan Eckhart (CP) - Flew on 24 credited combat missions: With Capt Cote - All Capt Cote missions except for missions #43, 60, 75 & 83. Was Upgraded from CoPilot to Pilot and flew 4 missions as First Pilot (80, 81, 83, 85). On mission 85, 1 Dec 1943, ditched a new B-17G 42-31243 (No name) (427BS) GN-Z, on its first mission, in the English Channel at Pegwell Bay, England when the B-17 ran out of gas. The entire 10 man crew was picked by the British Air Sea Rescue and taken to Manston, England. A British recovery team discovered the ditched B-17 in the 1990s in the marshland at Sandwich Flats near Pegwell Bay and were able to collect wreckage that was turned over to the British Brenzett Aeronautical Museum. The 25 mission combat tour of 1Lt Eckhart was completed on 1 Dec 1943 (Mission #85). S/Sgt Delvyn Smith (LWG) - Flew on 26 credited combat missions: With Capt Cote - (2 missions - 44, 47); With other 11 other Pilots - 24 credited missions (20, 21, 24, 27, 28, 29, 30, 31, 32, 33, 34, 36, 39, 40, 42, 48, 49, 50, 53, 54(A), 55, 56, 57, 63, 64). 25 mission combat tour completed on 27 August 1943. Mission #54, 26 July 1944. Aborted mission after 1 Hour 30 minutes when S/Sgt Gunsauls (Tail Gunner) became sick with an appendicitis. Mission #59, 16 August 1943 to Paris, France. 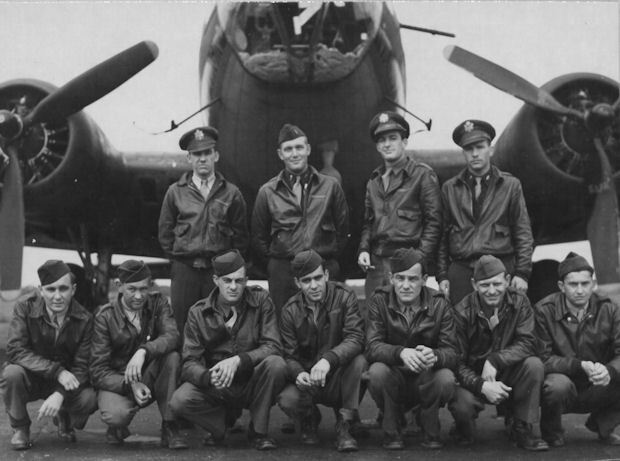 Six members of the Lt Cote Crew (Cote, Arter, Reaves, May, Micek & Smith) flew as the Lead Crew Crewmen with LtCol Kermit D. Stevens, Commanding Officer 303rd BG(H), leading the 1st Bomb Wing. Mission #83, 26 Nov 1943, to Bremen, Germany in B-17G #42-29955 Mr Five by Five (427BS) GN-I. The B-17 was last seen 10 km west of Texel Island over the North Sea when it dropped out of formation with its wheels down. It appeared to be under control when last seen. The B-17 crashed at Den Helder, Netherlands. All ten crewmen were killed in Action. The body of 1Lt John W. Hull (B) washed up on Terschelling Island, Holland on 13 Feb 1944.